Geographically, Leeds is a mere twenty miles from Haworth, the home of the Yorkshire sisters who stormed the literary world nearly two hundred years ago, and the National Theatre and Bristol Old Vic production of Charlotte Bronte’s greatest novel, Jane Eyre, has now come home to Yorkshire, after winning enormous praise in a short tour in 2015. This is a ‘Jane’ like no other, and it is no buttoned-up, introspective victim that we see. Instead there’s a rather feisty and emotional girl who rails against the torments and injustices of her life, but who possesses an iron will that leaves us in no doubt that she will deal with it. A petite but imposing Nadia Clifford plays Jane from the birth pangs of her short-lived mother, through her tortured childhood, to her instant, dramatic and passionate love for Rochester, with an assurance and strength that belies her stature and youth. She is mesmerising, and compels the eyes to follow her every move. I like Clifford’s convincing Yorkshire accent, which brings authenticity to the role, and the flat accents of the north are surprisingly fluid and moving in her words of love to Rochester. I like too the exhaustive on-the-spot running which replicates movement and travel by coach. Innovative and clever, it is extremely effective. 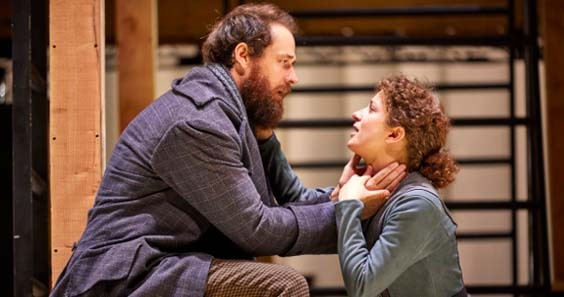 Tim Delap gives a solid performance as Rochester, but just misses out on the emanation of strength and power that would be expected from a wealthy man of the era. His love for Jane is clear though, as is his inner torture at what he must do to win her. Most of the supporting cast take on multiple roles, and outstanding amongst them is Lynda Rooke as Jane’s cruel aunt, Mrs Reed, and the kind housekeeper Mrs Fairfax. She fulfils each part fully and assuredly, and is totally convincing in both roles. Sally Cookson’s dynamic and innovative direction gives us a fast paced story, whilst Michael Vale’s stark set of wood and metal structures with stairs and platforms is surprisingly flexible and adaptable. With minimal props it mutates into everything from genteel Victorian lounges and bare schoolrooms to the bedrooms of Thornfield or the wild moors. The lighting is superb and Aideen Malone’s skill manoeuvres the emotions with consummate skill. There are many unusual touches to this production, not least the presence of musicians on stage and a singer whose voice adds a plaintive note to the story. Melanie Marshall has a beautiful voice which resonates powerfully as it plays the role of narrator and emotional guide to the drama. And let’s not forget Paul Mundell’s rather startling role of Pilot, Rochester’s dog. Though certainly not essential to the story, it gives some light relief each time he appears, and, whilst not in the forefront of great acting, manages to bring a smile to the faces of the audience each time he appears, hopefully with his detachable wagging tail. This production is not Jane Eyre as we know it, nor indeed what some purists would like to know. But it is totally true to Charlotte Bronte’s agonising and uplifting story, and is presented with a glorious panache and total acceptance of its genre, which truly touches the soul. Surely that is precisely what Charlotte intended Jane Eyre to do.